Spray pump assembly for lotion, liquid or aerosol pumps on continuous motion machines at speeds of up to 550 pumps per minute. Our intermittent motion machines are capable of delivering 60 units per minute with 1 head and 240 units per minute with 4 heads. 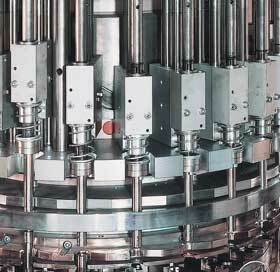 All of the machines are designed to the highest quality and accuracy. Spring assembly with spring sorting and feeding. No tangled springs! Leak testing to verify the can is not leaking.